Nobody will try to deny competitiveness of Skoda’s products in Europe. Neither will anyone try to negate its unprecedented sales boom in last 20 years. But also none can’t dispute the utter lack of charm and pure plainness of its offering. Position within VW Group defined it as a reasonable and spacious offering and being on German tight leash prevents Czechs from any exciting experiments. 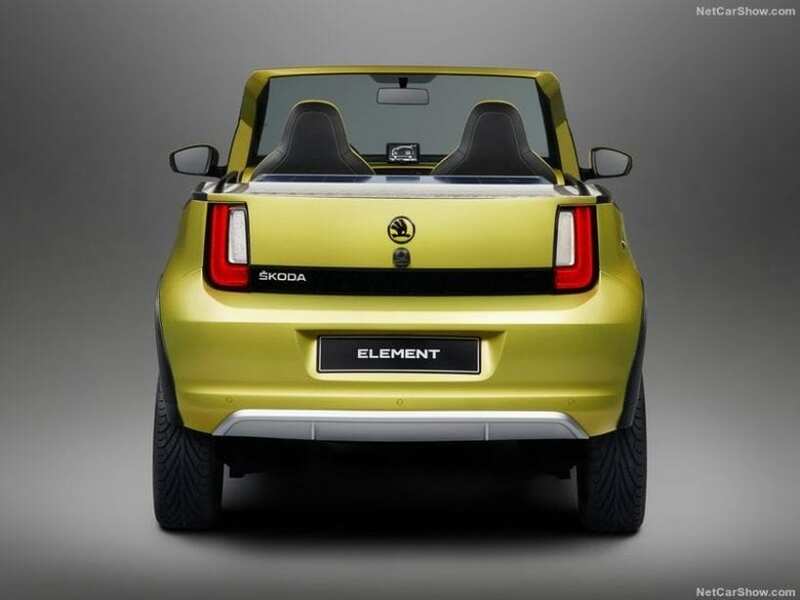 Though, that count for things that actually fill dealer’s rooms, leaving space for 2017 Skoda Element Concept to happen. 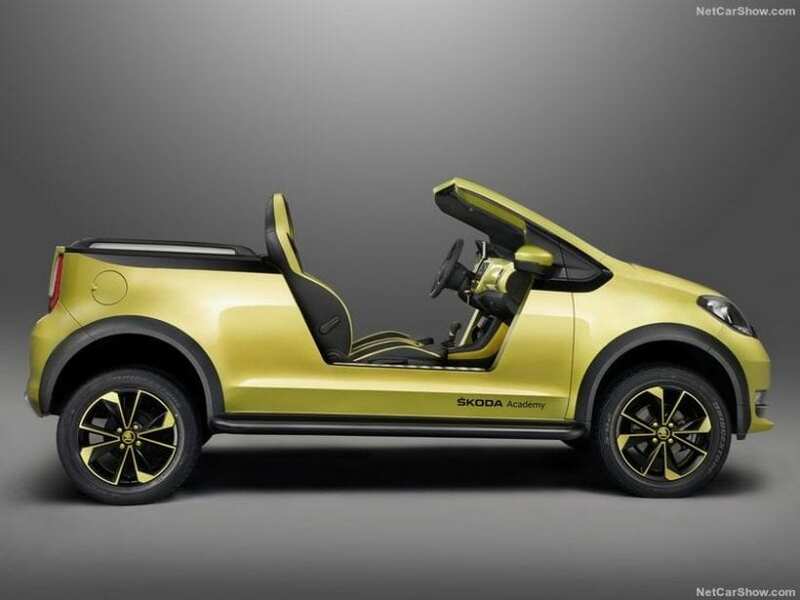 2017 Skoda Element Concept WHAT IS IT? Still, Citroen’s e-Mehari and Smart’s Crossblade indeed touched the roads in the hands of their buyers, which is not a suggestion that Element should too, more just as a note that car industry has seen some wackier days during its time. Inspired by the coolness of beach buggies, Citigo renounced its doors, roof, and half of tail. Painted in sand-ish yellow color, decorated with deep black touches and carrying striking 16-inch Scorpius wheels, this Skoda is actually fancy enough to gather more than a decent number of stares on any beach. Raised clearance by 2.3 inches might foul you that you can actually plow through sand, but the lack of any sort of AWD system will prove otherwise. Now, let’s get back to that yellow, as it is heavily used on the interior also, including dash, steering wheel, gearbox lever and finally on the nice looking mixed leather-Alcantara seats. There is more of unordinary stuff with it. In the place where you will usually find rear seats, here you’ll find solar panel, and if you lift the coverlid housing it, you’ll find boot, but not any kind of boot. This boot house 400-watt stereo system, capable of making real seaside parties, along with refrigerator good for storing drinks, non-alcoholic ones off-course. Finally mentioned lid from inner side feature smart TV bolted to it if you ever got bored with partying and wish for some open-sky cinema. While you are imagining yourself roaming the beaches, you would definitely prefer to stay away from affecting that beautiful sight slowly eating on the sand. We are referring to raising sea levels, which are “relatively” less caused by this 2017 Skoda Element Concept since it is purely electric. We had to use the word “relatively” as the production of electricity does its share of pollution, but nothing is perfect, right? The electric motor produces 82 hp and 155 lb-ft of torque, which pulls this Skoda to 60 mph in 13 seconds, while top speed is at 81 mph. That is really slow, but it does complement relax atmosphere around coastal areas. Maybe more important figure would be the fact that it can roam the sands for fair 100 miles, due to the 18.7 kWh lithium-ion battery stacked in the floor. 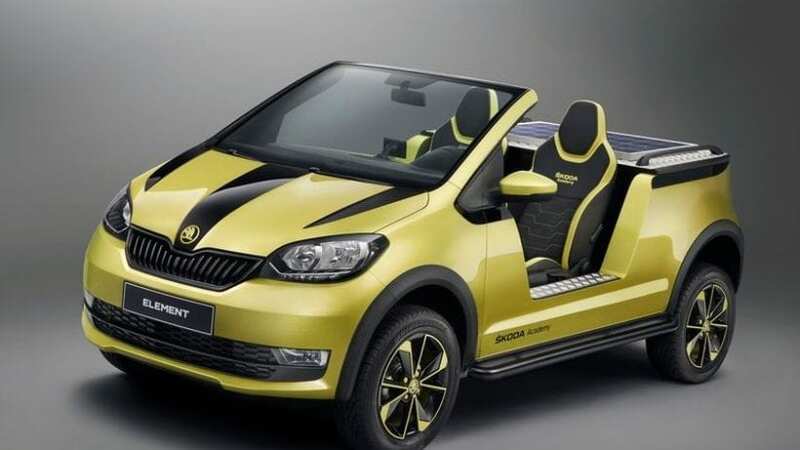 This all remains at the concept stage, but at least we know that Skoda does have some imagination in its veins.